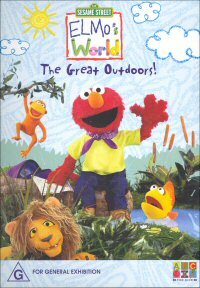 Elmo's World: The Great Outdoors is a great little adventure for kids showing them animals, weather and fish. The format is great and Elmo the little red monster is a sensational host, my kids love him! They've brought such a sense of fun to the show that the children will laugh the whole way through every episode as Elmo and his goldfish Dorothy sing and talk their way through each episode in a way that kids will remember what they are being taught in each show. Some of your favourites from the Sesame Street world visit Elmo in his adventures as well thereby linking the two shows nicely. For those who haven't watched either before, Elmo's World is actually a regular segment in the Sesame Street show proper, it's simply that Elmo is so popular with the kids in his own right that it is justifiable bringing them all together in this format. Your children will get to meet the animals of the jungle, the deep blue sea and a tornado all explaining their effects on the world. There's interaction with real children telling us their adventures and of course Elmo asks a question of a baby in each episode which I found very cute. I thoroughly recommend this DVD to all parents as being a father myself, I know first hand that your kids will get a blast out of it. Nice and clear in a made for television kind of way, there's certainly no problems with the transfer. Stereo mix that sounds great. Should have the kids laughing and singing along.